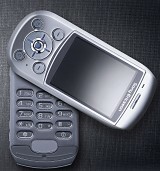 At first glance the Sony Ericsson S700i looks like a PDA, with a large 320x240 pixel display in 262,000 colours. There's a directional control on the bottom plus some control buttons. However, the first neat trick the S700i has is that it rotates open to reveal a standard telephone keypad, in a similar way to the much smaller Motorola V80. On the back of the S700i is a Sony 1.3 megapixel camera capable of 1280 x 960 pixels, a photo light and 8X digital zoom. This camera has four times the pixels of a "standard" VGA camera and will produce a much better image quality. The S700i supports Java 2.0 for applications and comes with 3D graphics acceleration, which combined with the large screen and easy controls makes this a very appealing games machine. Connectivity to a PC is through Bluetooth, infra-red or cable. There's an large range of Bluetooth accessories from Sony Ericsson too. Memory expansion is through Sony Memory Stick Duo cards, which is very useful because the S700i can also play back space-hungry MP3s. It's easy to forget that the Sony Ericsson S700i is actually a phone, in this case a tri-band GSM phone with GPRS. Battery life is impressive for this kind of device too, whith up to seven hours talk-time. Available now on O2, Vodafone and BT Mobile contracts and SIM Free. Subscribe to our newsletter for updates. If you want more information on the Sony Ericsson S700i, subscribe to our mailing list. Also, the Update newsletter contains general news about new phone releases.